Summary: The power of Bluetooth technology is expanding further than anyone imagined, and could start playing a huge role in mobile payment processing. Ever since Apple decided to part ways with the headphone jack and instead opt for their Lightning connector, it was met with much criticism at the get-go. However, due to this, there has been much speculation that wired peripherals were heading out the door in favor of newer technologies. Companies like Samsung and Apple are two of the growing number of smartphone manufacturers that are beginning to utilize Bluetooth technology to drive their technology. Before you know it, Bluetooth will become a force that affects everything from how one listens to music to even purchasing items through a mobile app. It’s already been made possible to transfer money digitally via Bluetooth. Now, merchants were slow to use this technology primarily because it’s expensive to make the switch. However, after the necessary adjustments were made, along with the rise of smartphones over the years, Bluetooth technology is really starting to pick up steam. It’s paved the way for a wide array of peripheral devices including mobile payment systems and card readers. Bluetooth and WiFi are two devices that work well within the restaurant and retail sector. By utilizing two devices in-sync with each other, an order can be taken from a restaurant, for example, and the other can process the payment. By working in tandem with one another, the entire process is expedited. The possibilities are endless, and with the power of Bluetooth leading the way, it’ll only get better from here. Another payment vehicle that’s also doubling down on Bluetooth technology is the digital wallet. By utilizing this technology, it’ll help the wallet make the payment to a retailer, restaurant or other sector. Additionally, these digital wallets are starting to accept a growing number of currencies all around the world – hence it’s exponential growth. Don’t rule out the idea of travelers only carrying a smartphone and a passport to foreign countries in the future. 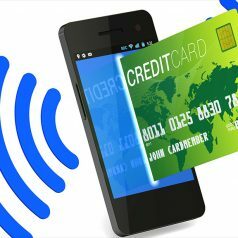 Blog submitted by Charge.com: Are you a small business that’s looking to accept credit cards instead of being a cash-only establishment? Let the folks at Charge.com help your small business find the perfect credit card solution. Visit them online today for more information.